We have verified that the use of the HappyAir application as support in the daily control of respiratory therapy, taking of rescue medication, presence of warning signs, performance of exercise, mood and saturation, helps to improve adherence to treatment and perception of patients’ health. During the study and investigation of these cases, the patient was accompanied by his trainer to carry out any consultation or seek additional guidance regarding any aspect of care related to his chronic illness, his daily life, the use of Apps, social support or incidences of adverse events such as income from falls and other illnesses. 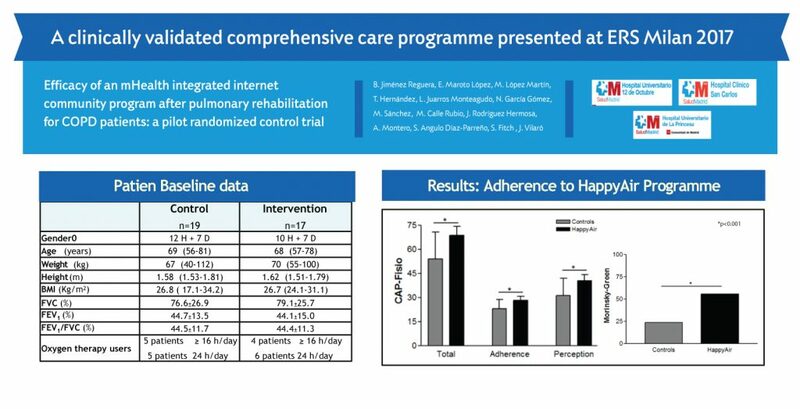 The study of these cases included a preliminary phase of 2 months with sessions of respiratory rehabilitation in collaborating hospitals and a second phase in which an “intervention group”, composed of patients, tested the use of the HappyAir App, with which subsequently, they were monitored by the Therapeutic Trainer for a period of 10 months. You can read about the results of the pilot here or write us at cuentanos@lovexair.com to ask for a more extensive document of the study and its results.